Equipped with quarter pipes, bowls and grind rails, the state of Iowa has some awesome skate parks to check out. Spread across the state, many of the skate parks in Iowa are part of a larger city park system, and all are very welcoming to all ages and skill levels of skaters. Most skate parks are unsupervised and open in the daylight hours, and every skate park in Iowa highly recommends protective equipment to be used while skating. With safety in mind, check out all the fun to be had at these 10 best skate parks in Iowa. Home of the Hawkeyes, Iowa City also has a popular skate park located at Terrell Mill Park off the riverfront Dubuque Street. In operation since 2002, this 11,000 plus square foot skate park has bowls, grinding rails and often a large mix of skaters skilled and learning occupying the space all 365 days of the year that it is open. Located in Brookside Park, the 10,000 square foot Ames Skate Park is the perfect place to meet fellow skaters and utilize the numerous grinding rails, ramps and stairs to hone your skating skills. Bikes are not allowed at this gem of a skate park, and skating is welcomed from dawn to 10:30 at night. As with all skate parks on this list, protective equipment is highly recommended. Sitting next to the Prairie Ridge Aquatic Center on Prairie Ridge Drive, the Prairie Ridge Skate Park is a modern destination with all the skating amenities. Featuring a 15-foot diameter bowl with six-foot walls, plus two sizes of quarter pipes, grinding rails and a four-foot pyramid, the Prairie Ridge Skate Park is the perfect place to go to practice your skating skills. Open since 2002, the Riverside Skatepark in Waterloo has been giving fun opportunities for all ages of skaters ever since. Located in Exchange Park, this skate park is free and open every day the weather allows it, and bikes are even allowed at specified times to join in on the fun. 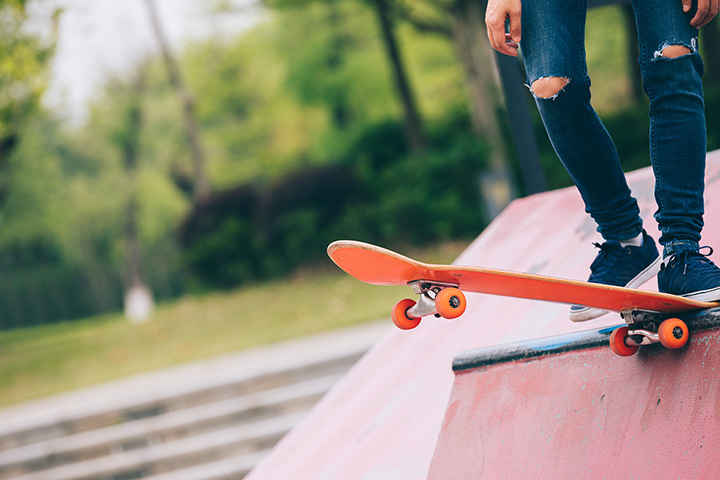 Located in Musser Park of Muscatine, the Muscatine Skate Park has been providing skateboarders, inline skaters and BMX riders the opportunity to improve their skills since 2003. Featuring a stunt and obstacle area, an in-line skating rink and plenty of parking, the Muscatine Skate Park even has lights, keeping the skate park open until 11:00 p.m. Constructed in 2000, the Cedar Falls Skatepark is a tucked away skating gem complete with two quarter pipes, a grind box and a half pyramid with a ledge. Skaters of all ages can enjoy the Cedar Falls Skatepark, and if you’re looking to learn some new skills, it’s a great location to try out some new tricks. Broadway Skate Park in Council Bluffs is one of the premiere skate parks in the state, and that’s because it’s decked out with a bunch of awesome skating features. Snake runs, fun boxes and quarter pipes, there is enough edges to skate on at the Broadway Skate Park to occupy your entire dawn to dusk time you can spend there. The Indianola Skate Park, as part of the larger Memorial Park, has some of the most features you’ll find in any skate parks of Iowa. A spine to skate on, steps to grind and a seven-foot ramp to practice your landings, this skate park is open from dawn to dusk, year-round, and always operates as an unsupervised place for skaters to learn. As part of the larger Walker Johnston Park, the skateboard park section features two escalated quarter pipes (20-feet wide), a fun box, street spine and two sets of stairs complete with a grind rail. Open for all ages and abilities of skaters, the Walker Johnston Skateboard Park is open year-round, weather permitting. As of 2015, the planned skate park in Dubuque had yet to be completed, but the city has taken steps and bookmarked over $50,000 towards its completion, and once this skate park is finished, it will be amongst the best in the state, if not the entire Midwest. With an impressive design and plenty of space, this skate park will offer every amenity and more for the local skating community, providing a safe space for all ages to come and play.